It has a two on the end and everything. Unfortunately, the sequel to Omgpop's excellent Pictionary-but-better mobile app, Draw Something, isn't called Draw Something 2: Draw Harder. That, in turn, means the third game won't be called Draw Something With a Vengeance. Come on, Zynga, you're really missing a beat here. So what does Draw Something 2 add to the formula? Aside from more patterns, colors and tools with which to craft horrifying approximations of objects and concepts, the sequel also adds thousands of new words and phrases for you to butcher with your ham-fisted attempts at art. There's a handful of new game modes tailored for people who prefer drawing words or guessing them, as well as a free draw mode that lets you draw whatever you please and share your creations via email, Facebook, Twitter and Instagram. Social integration seems to be what Zynga is going for in Draw Something 2. It's thanks to the frequent sharing of funny drawing sessions that the original game became a pop culture phenomenon, and it looks like it'll be easier to share, follow and like art from Draw Something 2 thanks to integrated live social feeds and public galleries. 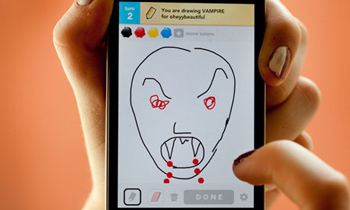 The original Draw Something was developed by New York-based developer, Omgpop. After Draw Something went on to be an iOS hit, with some 50 million downloads in its first fifty days on the market, Zynga picked up both the game and the developer for a smooth $180 million.